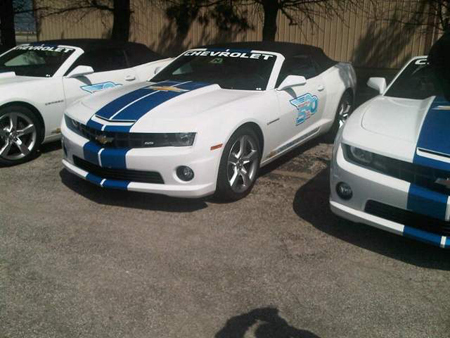 Cars that look like the Indianapolis 500’s pace car have been spotted in Indianapolis. But as it turns out, a shipment of decaled 2012 Chevrolet Camaros now in Indianapolis will be used by the 500 Festival committee. Indianapolis Motor Speedway spokesman Doug Boles said the official pace car will be announced next week. “It’s either a Camaro or a Corvette,” he said, declining further comment. The celebrity driver of the official pace car also still is to be announced. Last year, A.J. Foyt drove it after Donald Trump stepped aside amid controvery.